The folks from ZSP decided to take direct action against a property speculator which is trying to evict a family. KOL and other tenants activists blocked her eviction, but the speculator was still pushing and another eviction attempt was scheduled. The members of ZSP, together with the affected and a couple of others decided to picket her restaurants. After that, the speculator backed off. 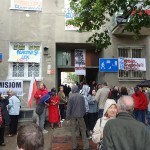 Solidarity with Tenants from Stanislawa Augusta St.
On June 1 we made a solidarity action with the tenants of a privatized building on Stanislawa Augustowa St. in Warsaw. The thuggish new owner had given tenants until the 1st to vacate the building, threatening to evict them after that. All of the tenants, who are members of KOL, stood in solidarity together. We all went to the building to show the owner that we will block any attempts he makes against these tenants. We are also fighting this privatization in various legal ways. The thuggish owner drove by several times, but didn’t do anything. 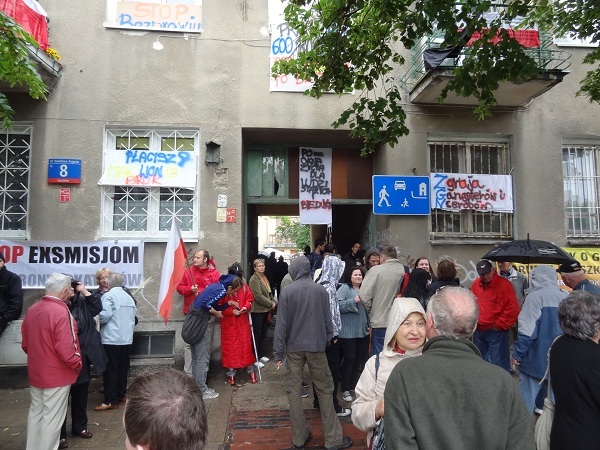 Skomentuj Solidarity with Tenants from Stanislawa Augusta St. 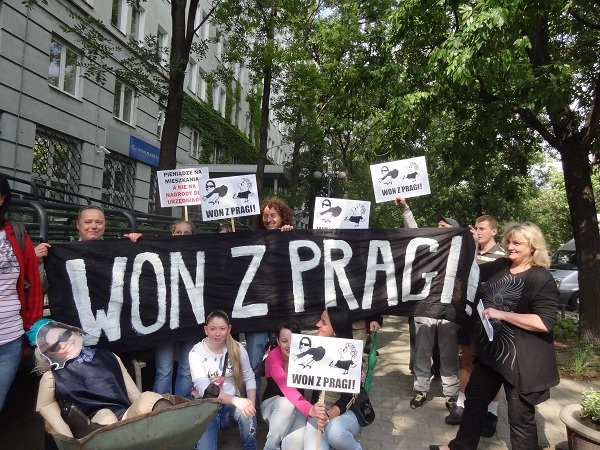 Tenants interrupted the local council meeting and demanded a vote on dismissing Katarzyna Legewicz who was appointed vice-mayor of the area, without any vote. (The people in charge of the neighbourhood were appointed by the President of Warsaw.) Some councilpeople supported this appeal but the neoliberals and leftists didn’t want to vote. Tenants are gathering signatures to force this issue to a vote. Legewicz is known for her particularly arrogant and awful treatment of tenants and being an architect of brutal gentrification polices. The Tenants Defense Committee has submitted a negative opinion on proposed ammendments to the Act on the Protection of Tenants’ Rights. The opinion was sent to the Ministry of Transport, Building and Maritime Economy, responsible for this bill, and to members of the government, the press and various organizations. Polish law requires that before certain draft bills are sent to the Parliament, they have to be “consulted” with the appropriate organizations. By “consulted”, that usually means that you send your opinion. If it is different than what the government wants to achieve, they usually ignore it. The Tenants Defense Committee is taking action in the case of a poor family which the city has ordered out of its house. It is starting eviction proceedings because of the family’s debt. Unfortunately, the city was one of the main contributor’s to this family’s hopeless situation. Join us on June 8 at 17:00 on Rondo De Gaulle. 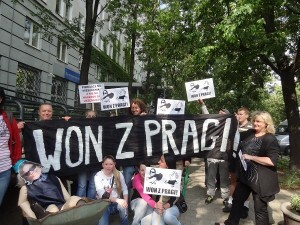 During the Euro 2012 in Warsaw, the Tenants Defense Committee welcomes foreign visitors to take the Euro Reality Tour of the Praga district, near the National Stadium. The Tenants Defense Committee is a grassroots, self-organized and self-funding tenants organization. It was founded in April 2009, following drastic rent increases in public housing in Warsaw, ranging from 200-300 percent. Since then, it has organized many actions in defense of tenants, including social and political protests, interventions at meetings of political bodies, conferences, public assemblies, eviction blockades, occupations of administrative buildings, meetings on public housing and so on. It includes many members and also has helped some tenants to organize associations in their buildings and blocks. The Committee members help other tenants to take action and resolve their problems, based on the ideas of solidarity and mutual aid. Although it is most active in Warsaw, it operates in other cities around Poland as well. The Committee’s doors are open twice a week in Warsaw and provide support and advice for up to 200 families a month. – An end to the anti-social housing policies that include privatizing and neglecting municipal housing and everybody violations of tenants right, both moral and resulting from the law. 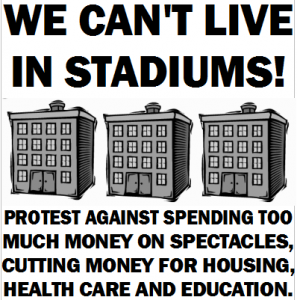 – That more public housing needs to be built and that there needs to be adequate budgeting for this. We do not agree with the spending priorities of the government, which cuts back in areas related to the most basic human needs. Housing needs to be treated like a right, not a commodity. – That the maximum income criteria allowing people to qualify for public housing is far too low and does not cover the working poor or have any relation to costs on the commercial market. – That the city of Warsaw stop privatizing buildings and handing over tenants to new owners/ administrators along with the buildings, without being given any replacement housing. The “return” of inhabited property, supposedly to pre-war owners, is in fact often the privatization of property to speculators who have bought claims or manipulated papers. There is no justice in this process and only hurts the tenants, who have contracts for public housing, but are “transferred” to the private sector, without retaining their rights and subject to rent increases, eviction, etc. – That steps are taken to ensure tenants regain their legal rights when they have paid off debts, instead of cancelling them, saying they are illegal occupants and keeping them there paying contractual penalties (that is, higher rents). – That public housing come under direct public control. In the framework of the existing system, this includes public control of the housing budget, the criteria for giving public housing, etc. By public control, we do not mean elected representatives who are not directly accountable, but we mean grassroots control by the tenants and neighbours themselves. More information on our positions or actions can be found in the English section of the page. They have also been described on various other portals, which you may find by searching.